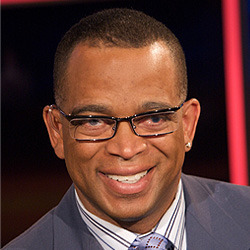 Over the past couple of days I’m sure you’ve heard and will continue to hear about the soul and the freshness that Stuart Scott brought to sportscasting and the sports world in general when made his debut on ESPN’s SportsCenter in 1993, and indeed he brought that and more. If I had to pick one thing to remember Scott for, I’d say it was love. His love of sports, his job, athletes, his community and people in general was undeniable. The love and passion that he brought to our TV screens day in and day out educated people about sports, culture and society as a whole. He loved his mission and we loved him for it. His dedication to and love of being himself brought vigor and diversity to an industry that had long been dominated by the opinions of people who looked, spoke and oftentimes thought alike. Because he loved what he did and who he was, sports, the news, the world will never be the same.